With each passing match, Juan Martin Del Potro looks one step closer to the form which made him the 2009 U.S. Open champion and a world number four. 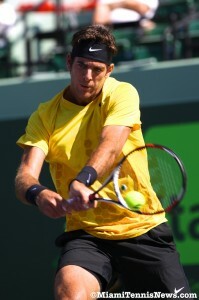 In the third round of the Sony Ericsson Open, Del Potro knocked out current world number four Robin Soderling 6-3, 6-2. With three titles already this season and a 20-2 record, Soderling should have felt pretty good going into this contest. However, a recent ailment and an earlier than expected exit at Indian Wells allowed just enough room for Soderling to doubt his chances. As a result of a net court winner, Del Potro obtained his fourth break point opportunity in the fourth game of the first set. The Argentine capitalized when Soderling’s backhand down the line sailed wide. Then, with an ace on game point, Del Potro consolidated for 4-1. Because of sensational serving, Del Potro guarded the one break advantage and carried the first set. After Del Potro broke the first game of the second set, Soderling came alive with two winners to go up 0-30. Yet, Del Potro’s serve came to the rescue. The Argentine saved the game for a 2-0 lead. Later, Del Potro captured an insurance break. Then with a strong game closed out the match. When Del Potro won the title in Delray, he felt that the true measure of the state of his game would be prevailing over a top ten player. Having accomplished this objective, Del Potro was asked to evaluate his progress “when you play against these kinds of players and [win it gives you a little bit of confidence]. Today, my serve, my forehand, my backhand, everything worked incredibly well. He’s a really good player. He had chances, too, but I took my opportunities. . .that was very important for my confidence”. 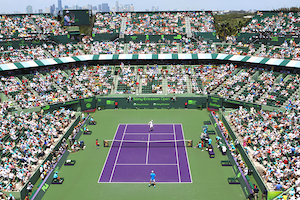 For 2010 Sony Ericsson Open semifinalist Soderling, on all fronts, his play was a disaster. Soderling commented: “I’m not playing well. I’m not feeling well. I’m not moving well. I’m not serving well. My serve is normally my biggest weapon. My backhand is not good. There are a lot of things I need to work on”. In explaining the drop in his performance since February when he collected a spate of titles, Soderling said “I had some tough times after Marseilles. I got sick and had some small injuries which I struggled with for a while. I haven’t been able to practice the way I wanted to”. Earlier in the day, Mardy Fish dispatched Richard Gasquet in straight sets. The reward for Fish’s hard work is a fourth round date with Del Potro. It’s a rematch of the International Tennis Championships semifinal whereby Del Potro was victorious. David Ferrer, the sixth seed, breezed through his match with Smodev Devvarman. In the subsequent round, Ferrer will contend with fellow Spaniard Marcel Granollers who shocked Michael Llodra. John Isner ended Alex Bogomolov’s dream run. Bogomolov booted fifth seed and 2009 champion Andy Murray in the previous round. Upcoming in the fourth round for Isner is Kevin Anderson. Anderson defeated Pablo Andujar who had victimized Fernando Verdasco in the second round. Novak Djokovic continues to be unstoppable. In under an hour, Djokovic bounced wildcard James Blake 6-2, 6-0 to book his spot into the fourth round. Djokovic will battle fellow countryman Viktor Troicki. Troicki topped another American Sam Querrey in a difficult three setter.